When most people think of making a glass block window, shower or wall they envision 8” x 8” units being stacked on top of each other – but why settle for a boring look when you can jazz things up using different sizes, patterns and colors? 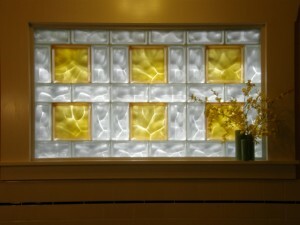 Learn 5 tips below to add some pop to your next glass block project. 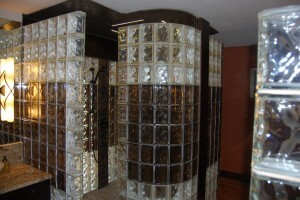 Tip 1 – Turn the block on its side – When you see glass blocks put together in most cases they are either square or vertical in their orientation. Consider placing the block horizontally instead. 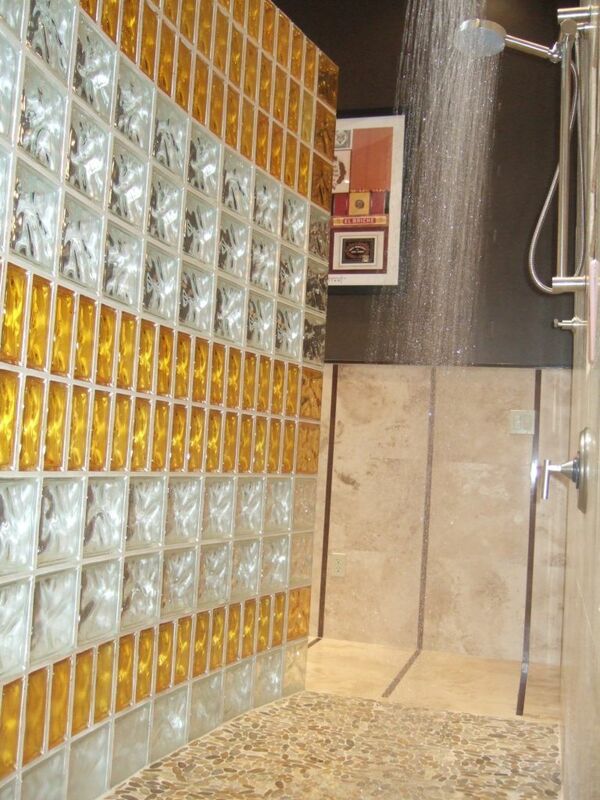 In the smaller glass block shower wall below the horizontal orientation makes the space seem wider. Tip 2 – Create a banding effect with 4” x 8” and 8” x 8” blocks – Alternating rows of 4” x 8” blocks in an 8” x 8” design can create a type of “accent” course to make a window or wall stand out. Tip 3 – Combine patterns, sizes and colors – Using the right color can create a calming (or vibrant) feel in a space. The project below (picture coming soon) used 8” x 8” x 3 1/8” Bromo pattern (by Mulia Inc.) color glass blocks with clear 4” x 8” x 3 1/8” wave pattern units to separate a shower enclosure from a pedestal sink in a small space in San Diego California. Tip 4 – Create a kaleidoscope by mixing glass block sizes with color- This bathroom window design combined 6” x 6”, 6” x 8” and 12” x 12” units for a one of kind look in a modern sleek bathroom space. 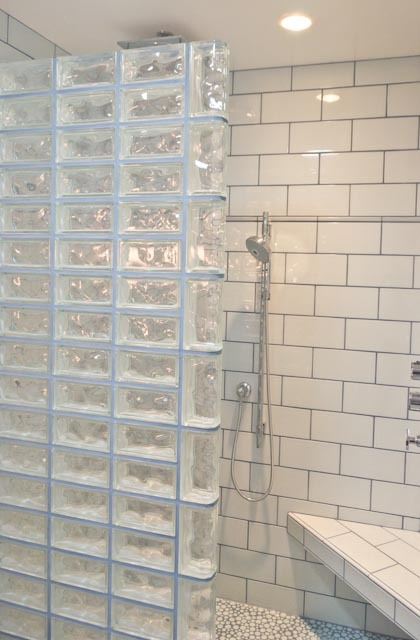 Tip 5 – Using shaped glass blocks to make a snail shaped walk in shower – With the introduction of curved and finishing end blocks it is possible to create shaped partition walls and showers that would be difficult to near impossible to do with other glass shower wall products. Check out the special look created in Othello Washington. What do you think about the use of a glass blocks after incorporating different sizes and colors? Please provide your questions or comments below. 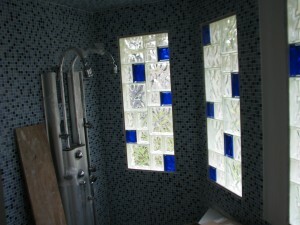 To get free estimate on a glass block window, shower or wall project or for nationwide supply of premade sections contact Innovate Building Solutions (877-668-5888) or for a local project their divisions including Columbus Glass Block (614-252-5888), Cleveland Glass Block (216-531-6363), West Side Glass Block (216-398-1020) or Mid America Glass Block (513-742-5900) of Cincinnati or Dayton and Akron (330-633-2900). really like the look of the blocks. When the light shines through they look very nice!